Are you planning a wedding, corporate event or private function? Evan is an experienced performer, creating the ideal musical accompaniment to your function. 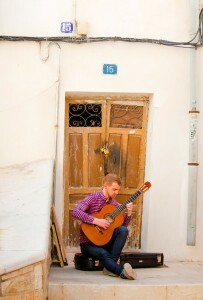 With a wide range of repertoire available including many Spanish popular classics and works from the Classical, Romantic and Baroque periods, Evan’s playing is sure to match any occasion. Repertoire is chosen in consultation with you to ensure a successful event. Specific requests are available for a fee. Evan can provide high quality amplification to suit any size venue and supplies all necessary equipment. Evan has over 20 years playing experience. His professional and reliable service will ensure your next event is a success! Contact Evan for an individual quote by clicking here! You gave a wonderful introduction to the afternoon! Your playing was just what was required to bring people to a place of reflection and learn of places that they had never been to… Your music and your calmness filled the bill perfectly. Ross Edwards - Blackwattle Caprices: Movement I.